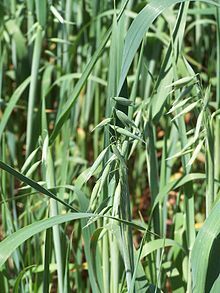 Oats (Avena sativa). Wikipedia photo. Phenolic antioxidants in oats obstruct the ability of cholesterol to stick to artery walls. Researchers funded by the Agricultural Research Service have shown that these compounds, called avenanthramides, significantly suppress the adhesive molecules that “glue” blood cells to artery walls.